Balance4Life Programs is a multi disciplinary practice that offers bespoke programs for professional and personal development. 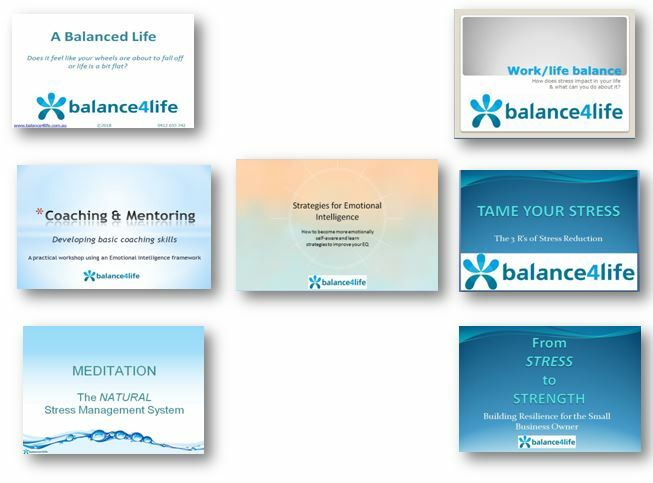 Balance4Life Presentations include Stress Management , Meditation for the Workplace, From Stress to Strength – Developing Resilience and workshops designed specifically for Not For Profit organizations, schools and other interested organizations. Previous presentations include Small Business Victoria workshops, teacher professional bodies and Local Government. Support for students who are apprehensive or overwhelmed by their study loads and the expectations of the VCE years and beyond. Support for teachers who need effective stress management skills; who may have lost their enthusiasm and want to create a better work life balance. Health and Wellbeing programs for people who want to reduce weight or change unhelpful habits.